When somebody brings up the rotary engine, the mind naturally wanders to Mazda, but it was German based NSU Motorenwerke AG (later absorbed into Audi/VW) that allowed engineering genius Felix Wankel to design and release the first production rotary engine in an automobile. Mazda might be well known use of the Wankel rotary starting in 1967 with the Cosmo 110S and ending with the last RX-8 to roll off the assembly line in 2012. However, NSU released the famous apex seal eater first with the '64 NSU Spider and then the '67 Ro 80. Find this 1969 NSU Ro 80 currently bidding for $6,600 reserve-not-met with 5 days to go on ebay, located in St. Louis, MO from the fantastically cool collection at Moto eXotica. If you gasped and said "what the heck is that?" when you first saw this car — don't fret, you are not alone. Anything from NSU is rare to seen in the wild in the 21st century and the Ro 80 is rarer than a golden hen's tooth. 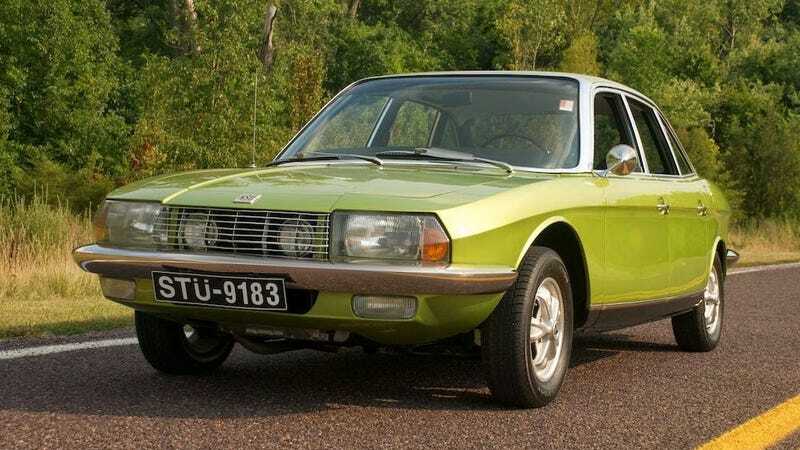 The Ro 80 is an oddly handsome car, an early production from noted designer/product leader Claus Luthe (NSU Prinz/Spider, Audi 50/100 and then BMW E28/E30/E31/E32/E34/E36). The design was very advanced for a mid-sixties car and looks like a predecessor to the Audi 100 with a little bit of BMW E12 thrown in the mix. Powering the Ro 80 was a 995 cc two-rotor Wankel engine, rated at 113 horsepower and mated to the front wheels via a longitudinal transaxle. This put most of the engine/transmission weight directly over the driven wheels, so it should be good for snow/rain traction. On the inside you can see what looks like a conventional 3-speed manual gearbox (dog-leg 1st gear according to the dash labeled shift pattern - reverse is front and center) but the lack of clutch pedal and P gear designation mean this was something special. The Ro 80's only available transmission was a semi-automatic that required the driver to select gears, but automated the clutch actuation via a vacuum system. It sounds like something that belongs in a French car and probably works about well as the average Harbor Freight power tool. Some assembly... disassembly...re-engineering...re-assembly required. Volkswagen used a similar system in their short-lived "Automatic Stickshift" version of the late-60s Beetle. Originally posted as DTO: You Spin Me Right Round: 1969 NSU Ro 80 on Daily Turismo. DT reader IgnatiusReilly tipped us off that this car was previously sold for $24,200 at the Auctions America Auburn Spring auction in May 2014. The auction listing says it was from the John Scotti collection, allegedly the largest Canadian car collection ever sold at auction. Thanks Ig!